If you have further information to share please contact me. The Cherokee Insurance and Banking Company seems to be one of the oldest banking establishments of Whitfield County and was located at 15 Crawford Street in Dalton. They were incorporated Feb 8, 1850 by the General Assembly of Georgia. 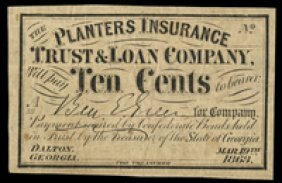 According to the article "1860s Banking in Dalton" this bank issued 50 cent, 70 cent fractional bills and $1, $2, and $5 examples of which are below. Col James H Bard was president and W L M Wright was cashier as well as W J M Thomas. In the 1860 census of Dalton at household 792-793, J. H. Bard is shown as a broker and his son Willie D Bard is shown as a teller - I would guess for the same Cherokee Insurance and Banking Company. The Augusta GA city directory of 1859 lists this bank as "bad and unworthy". This bank closed by 1873. Planters and Mechanics Bank, was started in February 1854. John Morris was president of this bank. T. B. Thompson was the cashier (possibly the same T B Thompson who was in Catoosa Co GA as a grocer in 1860?). This bank re-organized in December 1859 and became the Bank of Whitfield. The Augusta GA city directory of 1859 lists this bank as "bad and unworthy" along with Cherokee Insurance and Banking Company. Here are some examples of the monies they circulated. The Bank of Whitfield was created by the reorganization of the Planters and Mechanics Bank of Dalton in December 1859. Its presidents were M Burnes, Larkin Fullilove (shown as a bank note reporter living in Cincinnati, Hamilton, Ohio in 1860 and living in Atlanta in 1870) and James Morris (occupation listed as banker in the 1860 census, Dalton GA). Cashiers included Thomas B. White, Merritt Russell (shown as cashier for Bank of Whitfield in the 1860 census, Dalton GA) and George Wentworth. Was located at 3 Crawford St and later moved to Hotel Square, Hamilton Street. In 1863 the Bank of Whitfield moved to Atlanta. President was General Duff Green and this was chartered in December 1862 but does not seemed to have gotten off the ground. Ben Green, son of Duff, signed this 10 cent bill.